Private Alfred Wallis 234598 44th Battalion of Infantry, Canadian Expeditionary Force, was killed at The Battle of Vimy Ridge on 10 April 1917. 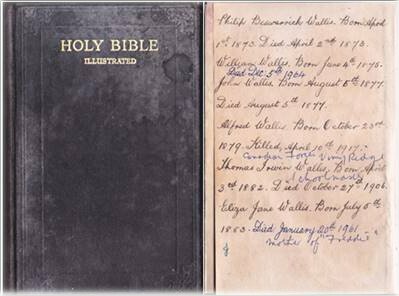 Known as Fred on his enlistment into the Canadian Infantry, his entry in the family bible (right) shows his given name of Alfred and his birth date as 23 October 1879 and that he was killed at Vimy Ridge fighting for Canadian Forces on 10 April 1917. Alfred was the sixth of eight children born to Thomas Wallis and his wife Elizabeth, nee Beswarrick. Elizabeth was born in Middlewood in 1851, the daughter of Philip Beswarrick and Maria, nee Buckingham. Alfred's connection with North Hill is, therefore, through his mother and grandmother. After his parents married Thomas took the family to live at nearby Stowe's Terrace adjacent to the Cheesewring quarry in Linkinhorne parish. 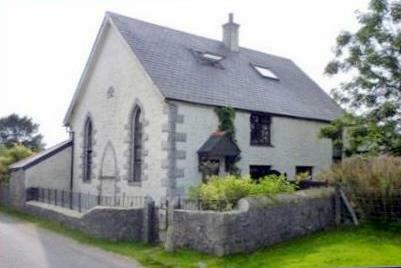 Alfred was baptised in the Cheesewring Chapel in Minions (pictured here). Thomas was a tin miner, probably working at the nearby Phoenix Consoles Mine. At some point in the 1880s the family moved to Gunnislake where Thomas continued working as a tin miner. 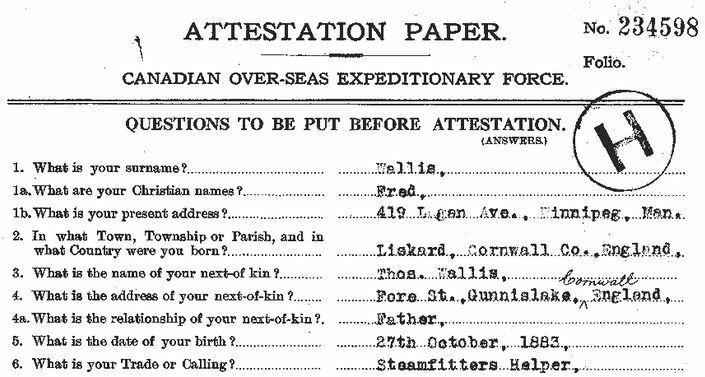 Alfred was working in St Breward in 1911 as a quarryman but already had thoughts of a better life in Canada. On 26 August 1911 Alfred sailed from Bristol on board the SS Royal Edward on his way to Montreal and then onto Winnipeg. He settled at 419 Logan Avenue in Winnipeg. He was posted to the 44th Battalion of Infantry which recruited in and was mobilized in Winnipeg. In France the 44th Battalion was part of the Canadian 4th Division and were prominent in the famous battle to take Vimy Ridge. 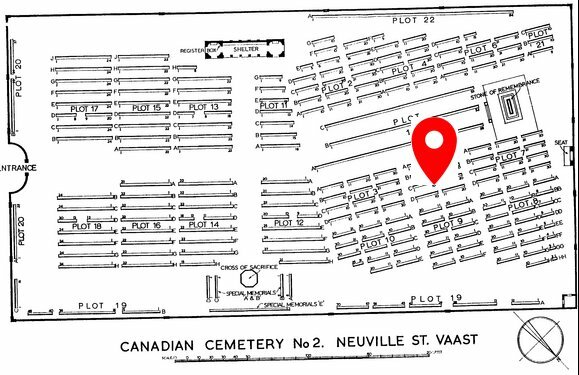 Fred is buried in the 2nd Canadian Cemetery at Neuville-St. Vaast.